Joy Spanabel Emery, A History of the Paper Pattern Industry: The Home Dressmaking Fashion Revolution. Image: Bloomsbury. The new book by the curator of the Commercial Pattern Archive is the first comprehensive study of the sewing pattern industry. Published through Bloomsbury’s academic imprint, Joy Spanabel Emery’s A History of the Paper Pattern Industry: The Home Dressmaking Fashion Revolution traces the history of commercial patterns from their beginnings in early modern tailors’ drafting systems to the 21st century. Emery is Professor Emerita of Theater at the University of Rhode Island, where she also taught in the fashion department. In addition to her articles on commercial sewing patterns, she is the author of Stage Costume Techniques (Prentice-Hall, 1981). The materials found in the University of Rhode Island’s Commercial Pattern Archive (CoPA) and the personal archive of CoPA founder Betty Williams are the main sources for the book, which focuses on the pattern industry and its role in the production of everyday clothing. Emery presents her research in short, textbook-style chapters, ending each chapter with a brief summary. In the back, readers will find an index, endnotes for each chapter, and a detailed bibliography with sections for primary sources, secondary sources, and archival collections. 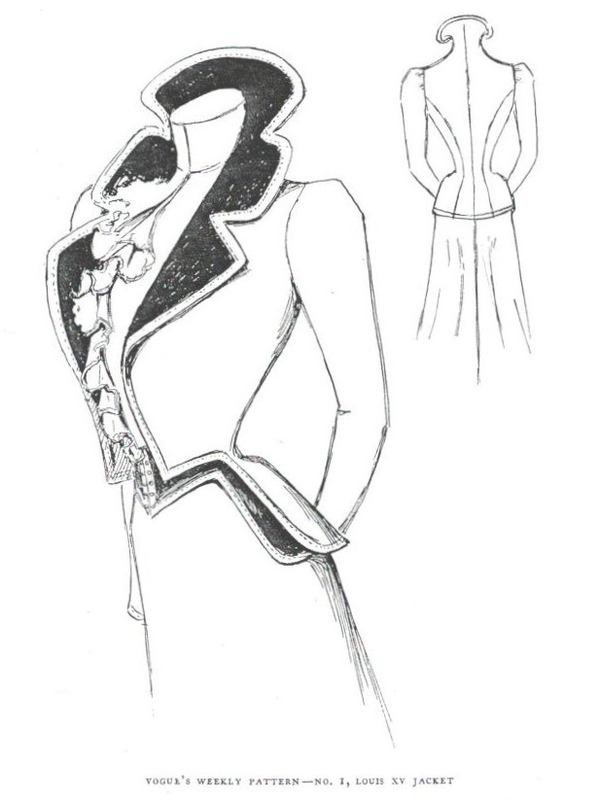 The first Vogue pattern: Louis XV Jacket, Vogue 1 (1899). From Joy Spanabel Emery, A History of the Paper Pattern Industry (Bloomsbury, 2014). As a special inducement to those who sew, the book also includes an appendix with nine patterns, each laid out on a grid by Susan Hannel, the chair of the University of Rhode Island’s fashion department. The gridded patterns range from an 1850s Demorest basque [bodice], originally published as a pattern sheet supplement in a ladies’ fashion gazette, to a 1960s men’s Nehru jacket from Spadea. Recent academic books on sewing have used the framework of gender studies to examine sewing as a cultural practice. Barbara Burman’s collection, The Culture of Sewing: Gender, Consumption and Home Dressmaking (Berg, 1999, to which Emery contributed a chapter, “Dreams on Paper: A Story of the Commercial Pattern Industry”), and Sarah A. Gordon’s “Make It Yourself”: Home Sewing, Gender, and Culture 1890-1930 (Columbia University Press, 2007) both present social histories of sewing that take into account changing understandings of femininity and women’s work. Emery’s book takes a more conservative approach to the material culture of sewing patterns, aiming to lay the groundwork for further study by focusing on the historical timeline of commercial production and technical development. Each chapter traces the industry’s new technologies and companies, mergers and closures as the pattern business landscape shifted from early diversity to today’s conglomerates. Official Yeowoman’s Costume of the U.S. Navy, Butterick 1101. 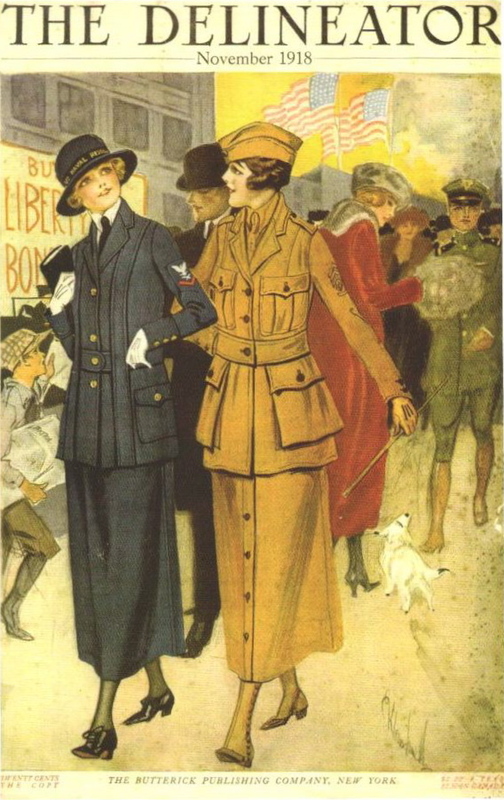 The Delineator, November 1918. From Joy Spanabel Emery, A History of the Paper Pattern Industry (Bloomsbury, 2014). 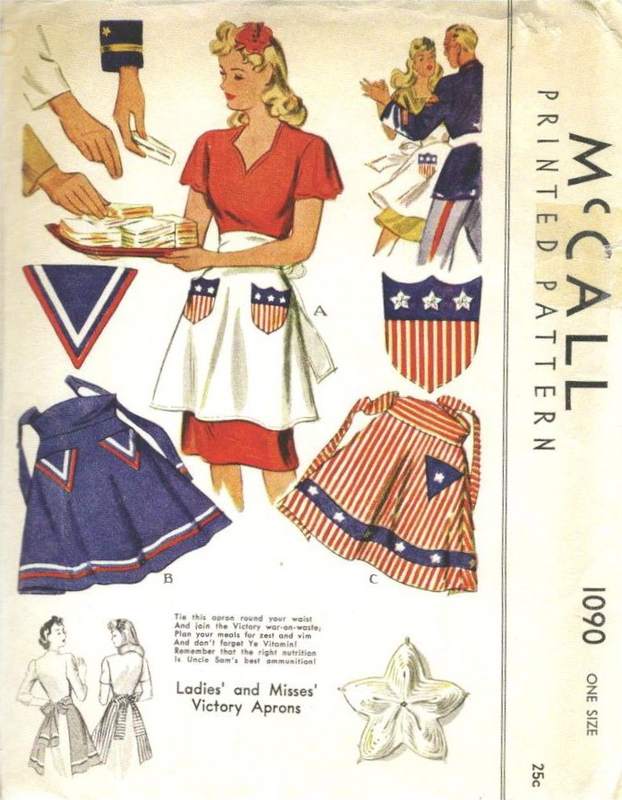 Ladies’ and Misses’ Victory Aprons: McCall 1090 (1943). From Joy Spanabel Emery, A History of the Paper Pattern Industry (Bloomsbury, 2014). Industry players competed to improve the sewing customer’s experience. We have McCall’s to thank for the printed pattern. Other pattern companies couldn’t duplicate the technique until McCall’s patent expired—although Pictorial Review found a creative workaround with patterns that were both printed and perforated. 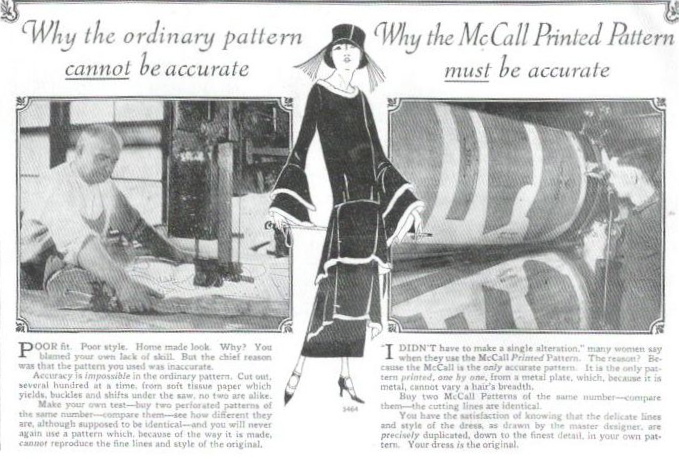 McCall Printed Pattern announcement, McCall Quarterly, Spring 1924. From Joy Spanabel Emery, A History of the Paper Pattern Industry (Bloomsbury, 2014). 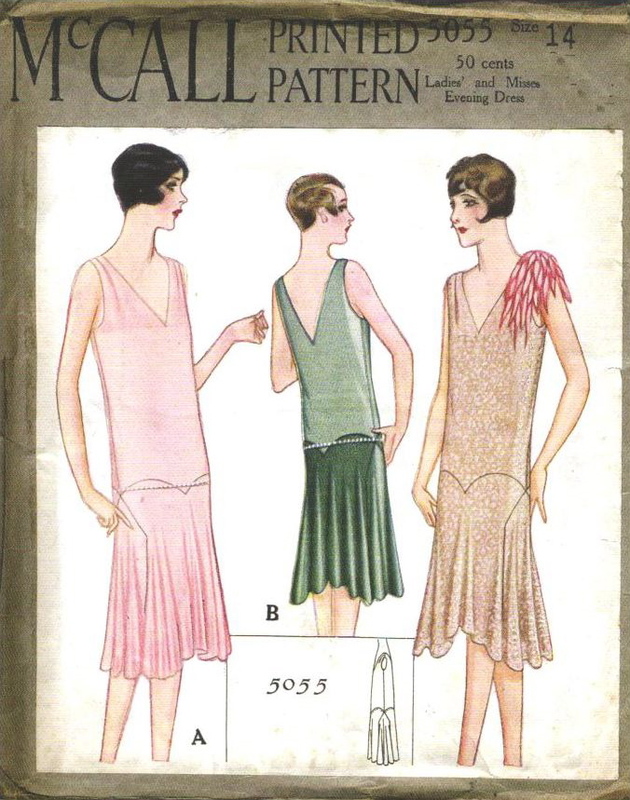 It was during the economic boom of the 1920s that the industry produced the first fully conceived designer patterns. As Betty Williams found in her research, McCall’s interwar couture patterns were based on garments purchased from Parisian couture houses for copying purposes. 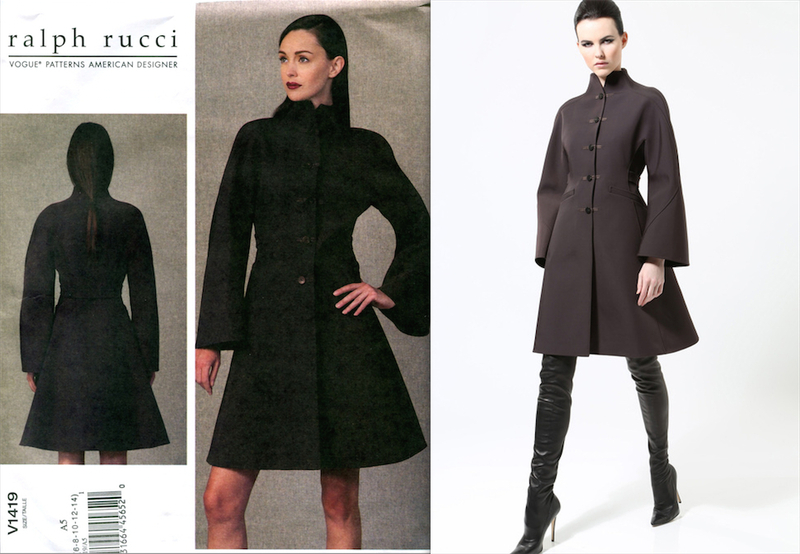 When Williams shared an early McCall Patou pattern with staff at the house of Patou, they agreed that the design looked like the couturier’s work, but were unable to find documentation of a McCall-Patou relationship (Williams 1995). * Intriguingly, Emery mentions a business agreement model along the lines of today’s licensing, but does not go into further detail. A couturier evening dress pattern by Madeleine Vionnet: McCall 5055 (1927). From Joy Spanabel Emery, A History of the Paper Pattern Industry (Bloomsbury, 2014). Infelicities of layout and organization occasionally disrupt the flow. 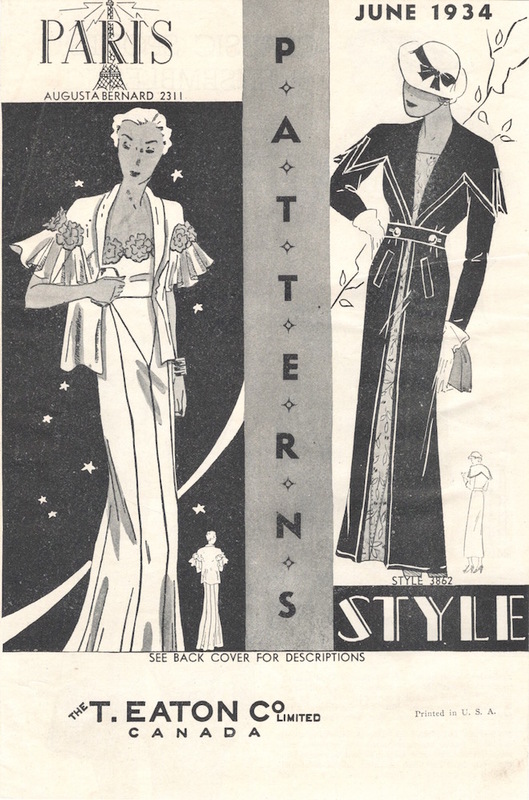 Including the discussion of interwar couture patterns in the 1920s chapter means that we read about the 1933 closure of the Paris Pattern Company, and see a 1930s example of a Paris Pattern, before reaching the 1930s chapter. Paris Patterns in fact survived beyond 1933: by the following year, the company seems to have merged with Style and was still releasing patterns for June, 1934. 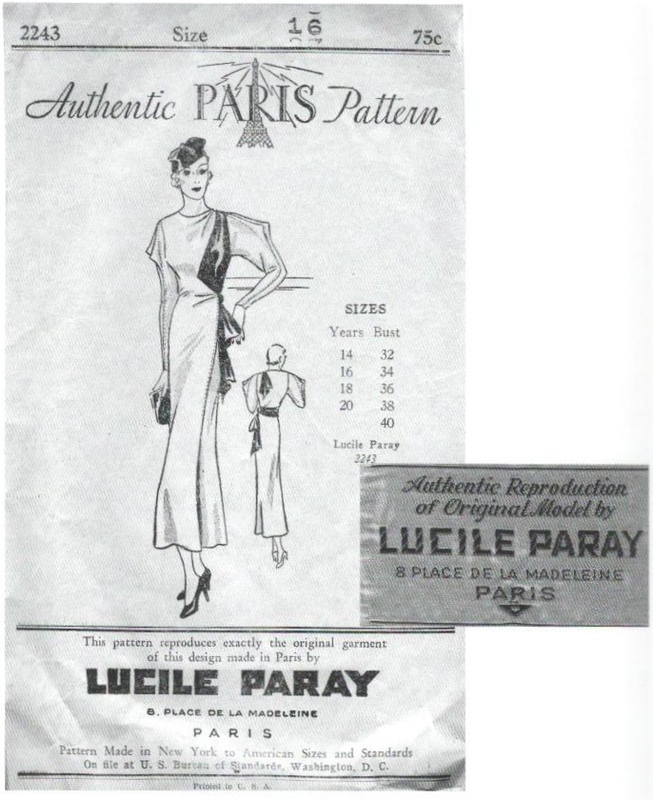 A couturier dress pattern by Lucile Paray with cloth label: Paris Pattern 2243 (1933). From Joy Spanabel Emery, A History of the Paper Pattern Industry (Bloomsbury, 2014). Paris and Style Patterns booklet, June 1934. 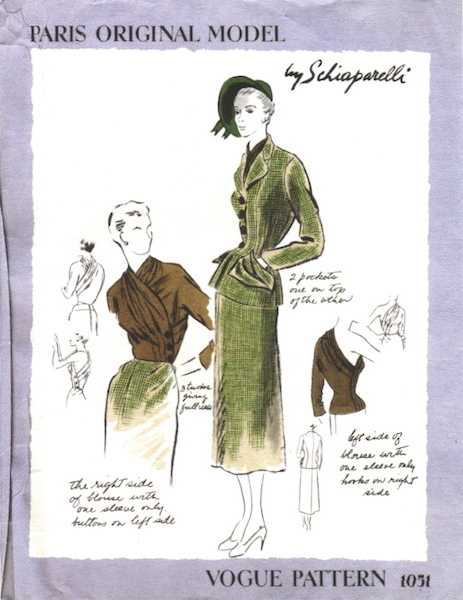 Schiaparelli’s first Vogue Paris Original: Vogue 1051 (1949). From Joy Spanabel Emery, A History of the Paper Pattern Industry (Bloomsbury, 2014). Countering the claim that commercial pattern designs are already out of fashion, Emery argues that patterns historically allowed their customers to keep abreast of trends, giving some interesting before and after examples of patterns adapted to reflect the new proportions of the postwar New Look. The question of the relationship between high fashion and the commercial pattern industry is an interesting one. Contemporary high fashion adaptations in pattern form are relatively current. Roland Mouret’s Fall 2005 blockbuster, the Galaxy dress, was adapted in 2006 as Vogue 8280, and Carven’s dress for Spring 2013 was adapted for that season as Vogue 8900 (see As I Said…). Current adaptations can be seen in McCall’s #sewthelook series on Instagram. 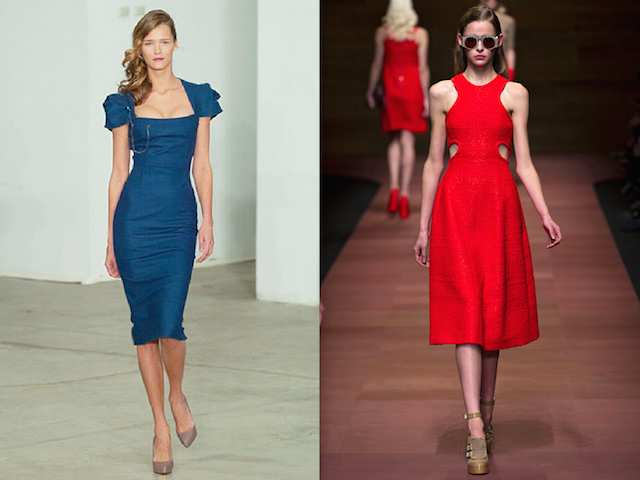 Roland Mouret FW 2005 and Carven SS 2013. Images: style.com. But licensed designer patterns are a different story. While trend-setting styles such as those from Yves Saint Laurent’s Mondrian and Ballets Russes collections could count on expedited production, more often there seems to have been a seasonal lag. A 1950s Laroche pattern discussed as typical in a contemporary report, Vogue 1450, is a design from the Spring 1959 couture that was released a season later, in late 1959. The originals for Simplicity 1105 by Cynthia Rowley (2015) – tent dresses with trapunto stitching, Spring/Summer 2015 collection. Images: style.com. Vogue 1419 (2014) from Ralph Rucci’s Pre-Fall 2013 collection. Images: Etsy / style.com. The fashion industry has changed, and fewer designers are willing to enter into licensing agreements for commercial patterns, let alone license current-season designs. Historical analysis of the pattern industry shows how it has adapted in response not only to economic and social trends, but also to home sewers’ changing relationship with fashion. Emery has taken a much-needed look to the archives in this essential resource. Joy Spanabel Emery, A History of the Paper Pattern Industry: The Home Dressmaking Fashion Revolution, London: Bloomsbury, 2014. * Betty Williams, “1920s Couturier Patterns and the Home Sewer,” Cutters’ Research Journal 6.4 (Spring 1995). ** According to a Forbes article cited on p. 201. For review purposes I received a complimentary copy from the publisher. What a fascinating and scholarly review. Thank you. This seems like such a wonderful book to have! All that wonderful vintage fashion in one publication sounds amazing! Wow. Thank you so much for this detailed, academic review. Amazing post. That looks like a fascinating book, and the review is very helpful! I had the pleasure of reading this book last year, and while it’s very dry (written as a doctoral dissertation?) and formal, Emery has done her work. As ever, a beautiful review. And a large thumbs up for the Amazon de-plug and New Yorker link. I work for a small publisher, and I am convinced their goal is to destroy the industry (so we all will write for them for free). And to think I once was paid $0.40 a work to review toys for them. Those days are long gone.